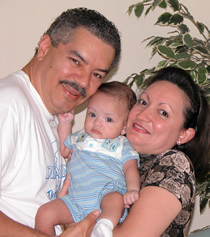 The Rios Family, These vacation rentals by owner units are owned and operated by the Rios family, Albert, Nelida and Emanuel, pictured here in 2002 photo when they were blessed with a son after fourteen years married. Emanuel was a long awaited blessing that we were finally sure would not come back in 2001 when Nelida said to Albert pack your bags I am taking you to Disney for your birthday. We packed and off to Disney we went and had a great time. It was my first time there and Nelida's second visit. Every day we would come back from the parks. I was a little tired but after a shower and a few minutes of rest I was ready to go back out. Nelida was always tired and did not really want to go back out. We found out why she was always so tired once we got back from vacation and she visited her doctor, he informed her she was pregnant. Albert and Nelida have worked in one of Wall Street’s financial company now for over twenty-five years. Most of our vacations have been spent back home in Puerto Rico. We love visiting with family there now more than ever that Emanuel is part of our lives. We are a very family oriented couple. We look forward to relocating back to the island sometime in the near future. Most of our family is in Puerto Rico and we want Emanuel to grow up around them. Villas de COSTA MAR vacation rentals by owner is our second home and we go back as often as we can. The Dorado area is beautiful and there is so much to do in Puerto Rico. We enjoy having family members come visit us when we are on the island and they love the area. I really think they look forward to our visits not just to spend time with us but also it is an opportunity for them to come enjoy Dorado and all the area has to offer. We look forward to meeting new and exciting people and growing our new family of visitors at Villas de COSTA MAR vacation rentals by owner. We invite you to take a break from the daily stress and come on down and enjoy our little Island paradise. Your family and you Deserve It! If you are interested in booking our accommodations; please use the below "Reservation Inquiry" form button and add any questions you may have in the comments field of said form. Please remember to add your contact number; be it phone or cell and best time to call in the comments field. We check reservation inquiries daily and will respond on same day unless it is late in the evening. We welcome you inquiry and questions with hopes of servicing your accommodation needs in Puerto Rico. Please do Not use the below "Contact Us" form for reservation inquiries, Use the "Reservation Inquiry" button below! Please use the below form for any questions about any of the articles or content on this website or to report any abnormalities.